U.S.: Syria used chemical weapons, crossing "red line"
"The president has made a decision about providing more support to the opposition that will involve providing direct support to the [Supreme Military Council]. That includes military support," Deputy National Security Adviser for Strategic Communication Ben Rhodes told reporters. President Obama has repeatedly said that the use of chemical weapons is a "red line" that, if crossed, would be a "game changer" for more U.S. involvement in the Syrian civil war. "The President has been clear that the use of chemical weapons - or the transfer of chemical weapons to terrorist groups - is a red line for the United States," said Rhodes in a separate written statement. "The President has said that the use of chemical weapons would change his calculus, and it has," he continued. In terms of further response, Rhodes said, "we will make decisions on our own timeline" and that Congress and the international community would be consulted. Mr. Obama is heading to Northern Ireland Sunday for a meeting of the G8 group of nations; Rhodes indicated the president will consult with leaders of those countries. "Any future action we take will be consistent with our national interest, and must advance our objectives, which include achieving a negotiated political settlement to establish an authority that can provide basic stability and administer state institutions; protecting the rights of all Syrians; securing unconventional and advanced conventional weapons; and countering terrorist activity," Rhodes said. Sen. John McCain, R-Ariz., who met with the rebels last month and has been a vocal critic of the president's Syria policy said in a joint statement with Sen. Lindsey Graham, R-S.C.: "We appreciate the President's finding that the Assad regime has used chemical weapons on several occasions. We also agree with the President that this fact must affect U.S. policy toward Syria. The President's red line has been crossed. U.S. credibility is on the line. Now is not the time to merely take the next incremental step. Now is the time for more decisive actions." "A decision to provide lethal assistance, especially ammunition and heavy weapons, to opposition forces in Syria is long overdue, and we hope the President will take this urgently needed step" they added. Former President Bill Clinton this week, at a private event with McCain, also ratcheted up pressure for the White House to increase its support to the rebels. However, Rhodes would not detail the type of military support the administration intends on providing. He said helping the opposition improve their effectiveness as a fighting force means helping with "nonlethal assistance" such as communications equipment and transportation. "These are things that allow them to cohere as a unit," he said. He added, meanwhile, that no decision has been made about enforcing a no-fly zone over Syria. "A no-fly zone... would carry with it open-ended costs for the international community," Rhodes said. "Furthermore, there's not even a clear guarantee that it would dramatically improve the situation on the ground." Rhodes laid out the intelligence assessment that led to the president's decision saying the U.S. intelligence community determined "that the Assad regime has used chemical weapons, including the nerve agent sarin, on a small scale against the opposition multiple times in the last year." Rhodes added that "the intelligence community estimates that 100 to 150 people have died from detected chemical weapons attacks in Syria to date; however, casualty data is likely incomplete." Although that is a small fraction of the more than 90,000 who have died in the civil war, Rhodes said "the use of chemical weapons violates international norms and crosses clear red lines that have existed within the international community for decades." "We believe that the Assad regime maintains control of these weapons," Rhodes continued. "We have no reliable, corroborated reporting to indicate that the opposition in Syria has acquired or used chemical weapons." The conflict in Syria has raged on since March 2011 when Assad began cracking down on protesters inspired by the Arab Spring. 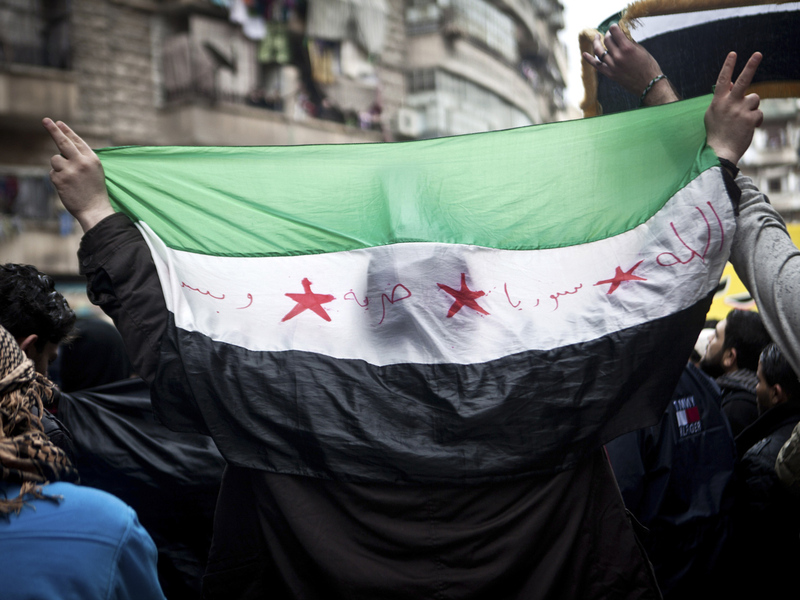 The war has fallen along ethnic lines, between the Sunni rebels and Assad's Alawite-dominated regime. Rhodes said today that the use of chemical weapons adds an element of urgency to the situation, as does the influx of foreign pro-Assad fighters from Hezbollah and Iran. While Mr. Obama has said unequivocally that Assad must go, the administration has said it's still aiming for his regime to engage with the opposition to reach a political settlement. In the absence of a political settlement, Rhodes said Syria would be left with "for all intents and purposes, a civil war" that Hezbollah and Iran would jump into. Syria's position in the heart of the Middle East makes the scenario particularly unpredictable. Rhodes further added that the end of the Assad regime should not have to necessitate the disillusionment in all elements of the state. "There is a future for those in the Assad regime who are willing to accept the end of Bashar Assad's reign but are willing to work for a better future for Syria," he said.